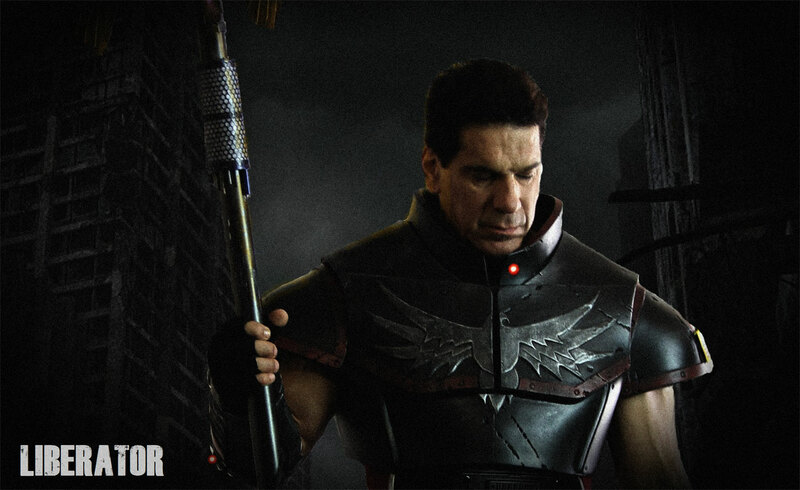 Lou Ferrigno’s (The original Incredible Hulk) new action short film Liberator, a 20-minute presentation pilot, is set to screen twice on Comikaze Con weekend, on September 15th and 16th. 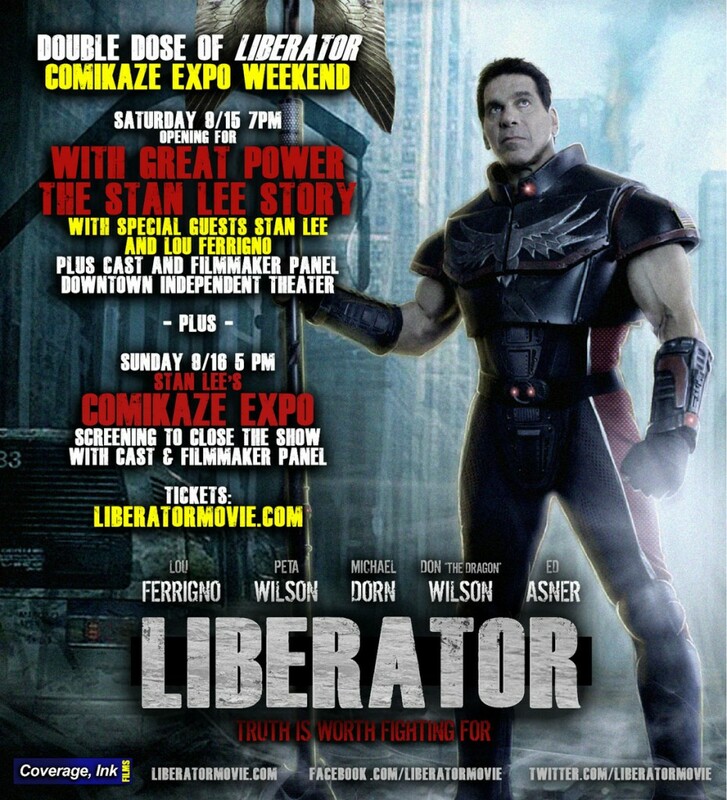 On Saturday the 15th, Liberator will open for the Stan Lee documentary With Great Power. The double whammy begins at 7PM at the Downtown Independent Theater. Stan Lee himself will attend, and there will be a panel discussion featuring Lou Ferrigno and the director & producers of both films, after the screenings. Then the following day Liberator will screen at Stan Lee’s Comikaze Expo, to close the show at 5 PM. Lou Ferrigno and other cast will also attend the panel discussion immediately following. In addition to Ferrigno, Liberator features an all-star genre cast including Peta Wilson (La Femme Nikita) as CIA spook Marla Criswell, Michael Dorn (Star Trek: The Next Generation) as General Augustus Pollard, martial arts star Don “The Dragon” Wilson as Sidewinder, Tara Cardinal as Gaia, and the legendary Edward Asner (Up) as President Whitlock. Jim Cirile is the film’s co-writer and Executive Producer. Aaron Pope is co-writer and Director. Former Marvel Comics Art Director Darren Auck created the film’s comic art prologue and graphic novel artist Gerry Kissell (Code Word: Geronimo) illustrated the film’s closing sequence. SyFy Channel’s Hollywood Treasure co-host Jesse D’Angelo designed the Liberator suit. The film features an original orchestral score by Tim Wynn, perhaps best known for scoring the hit video game Red Faction: Guerrilla. In Liberator, Ed Migliocetti (Lou Ferrigno, The Incredible Hulk) has served his country. When the endless war began, he put aside his football career to sign up for the military. And when the powers-that-be drafted him into the Enhanced Abilities Initiative, he became known as The Liberator. 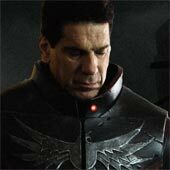 Teamed with a group of “supers” – Sidewinder, Gaia and Volt – Liberator represented the best of America. Or so he thought. He soon found himself doing the government’s dirty work – assassinations, regime change, infrastructure sabotage. Through it all, Ed followed orders. He was a good soldier. But when a black op went horribly wrong, Ed was thrown under the bus – the fall guy. In the blink of an eye, the Liberator literally went from hero to zero. After serving a decade in federal prison, he emerged a pariah. In the eyes of the public, he was a traitor. That, quite, frankly, he could take. What he couldn’t take was his own daughter Sonya (Jessica Jade Andres) hating him. Determined to set the record straight and win her back, Ed pens a tell-all book that draws the ire of his former chief, General Augustus Pollard (Michael Dorn, Star Trek: The Next Generation). Pollard dispenses CIA spook Marla Criswell (Peta Wilson, La Femme Nikita) to investigate. When they realize that Ed plans to blow the whistle after all these years, they have no choice but to take him out. After Ed battles his way out of a US military contractor’s compound, President Whitlock (Ed Asner, Up) declares the Liberator Public Enemy Number One – and sends Ed’s old teammates (Don “The Dragon” Wilson and Tara Cardinal) to bring him down by any means necessary. But this time, the Liberator is not going down without a fight.